Yesterday I had lunch at Sholo Ana Bangali with Kazima and then went to the Victoria Memorial to see an exhibition of students work from Rabindra Bharati University. There was also an exhibition of paintings and drawings by artists from the West, watercolours and prints from 18th & 19th century which was fascinating. 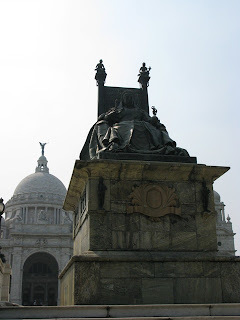 The Victoria Memorial is self-explanatory and much has been written about it. The monument was commissioned by Lord Curzon, the Viceroy at the time, after Victoria's death in 1901. It cost over ten million rupees and took sixteen years to build. It is an enormous classically designed white marble structure, and quite blinding in the heat of the day. As we left the Kolkata Pipe Band was standing to one side of the entrance and warming up for a performance. Bagpipes in Bengal, now there is another story.